Hi friends! Cottage cheeses chunks in tomato gravy with mild spices, tossed together in olive oil. Cut paneer/cottage cheese into small cubes fry the cubes in a non stick pan lightly. Cut tomatoes and puree in the blender, keep aside. In a non stick pan heat oil, add asafoetida fry till slightly pink, put cumin seeds when it starts crackling add turmeric powder, nutmeg powder, sugar, salt and mix well sauté for a minute. Add tomato puree, green chilli paste, and mix well bring it to a boil. Lower the heat and cook till the oil surfaces. Add cottage cheese pieces and fresh cream. Sprinkle cardamom powder, mix well. Let the mixture come to boil. Switch off the stove. Serve hot with any Indian bread of your choice. Note: After adding cream do not cook for long period, over cooking alters the texture and taste of the dish. Nutmeg goes well with certain types of savory dishes like cheese dishes etc. Paneer is a type of cheese. It is the Indian name for cottage cheese. 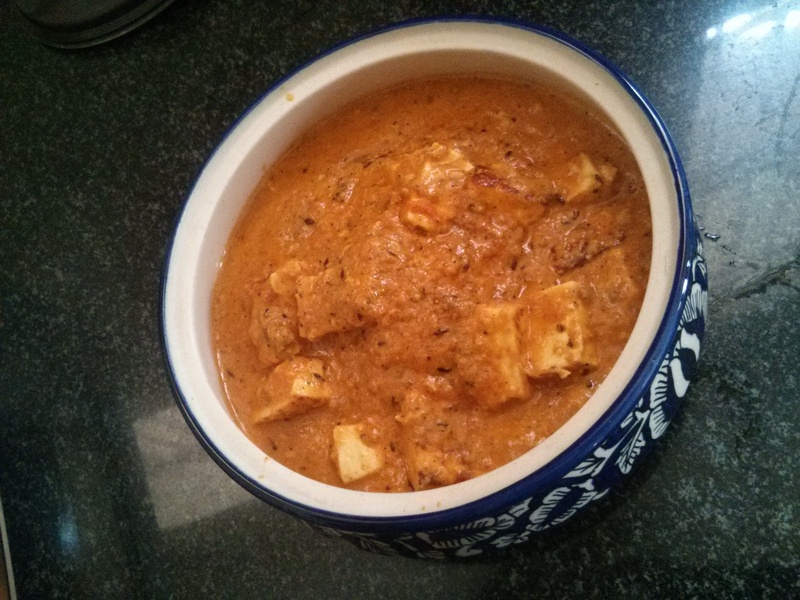 Paneer, unlike other cheeses, has not been matured and it is rather bland. Cheese is nutritious food made mostly from the milk of cows but also other mammals, including sheep, goats, buffalo, reindeer, camels and yaks. The milk is curdled using some combination of rennet (or rennet substitutes) and acidification.Bacteria acidify the milk and play a role in defining the texture and flavour of most cheeses. There are hundreds of types of cheese.